I’m opening a new restaurant which will cater to Bloggers everywhere. Here are some of the highly recommended dishes. 2. “All You Can View” Stew served in a Writer’s Block Crock pot. 5. Posted Eggs, Edited Over Easy. Served with Permalink sausage with choice of (depending how your writing is going) Belgium Awfuls or Fancakes, drizzled with Blog Cabin Syrup. 7. Choice of Mixed Metaphor Mesclun salad OR Cliched Clam Chowder – – served with a butter-me-up flaky blogroll. AFTER YOUR MEAL, Please Enjoy . . .
OR . . . we could always just eat our own words. ← Who’s Watching the Kids?? Thank you, Wish Granter Carl!! Haaa!! LOVE IT!! My favorite was Tweetballs!!! What a fun blog post!! LOVE it!! Thanks for sharing!! Following you now! Thank you so much for popping in for a visit, commenting and following! This is an awesome resource! Entertaining and informative. How sweet of you. Thank you very much! You are so welcome and thank you for sharing this with us all. I am a true believer of Sharing The Blogging Love! Awww thanks so much for popping in and being such a welcoming hostess on your own blog! Thank you so much for dropping in! It was fun to write but then I needed an antacid. 😉 Hope you have a great Sunday! Stephanie ps. Love that you’re an anonymous shopgirl, gonna check it all out! Hi there! Found your blog via the meet and greet at amomasview. As a gourmet lover, could I have a “All You Can View” Stew served in a Writer’s Block Crock pot please? Great post. Followed you over from Mostly Blogging! Thanks for coming by my site today and commenting in my Blogger group and on the post. Exciting to see the interest. Funny post, as always. I subscribed to your blog on Saturday but I don’t recall seeing this in my inbox. What day(s) do you post? Very very nice. I like it. Just chips British fluffy deep fried chips for me cos i love them… but served withsome Chinese dim “puns” gosh I am the Best whoops was that a pun? Haaa thanks for the pun today*sniggers* pun I meant fun. Little Miss Menopause, you are the funniest thing! Here from Mostly Blogging. I’ll take a #3, with the Italian Italicized Ice for dessert. Oh my gosh, thank you soooo much! LOL I’ll take a number 6 with a Deleted Donut. 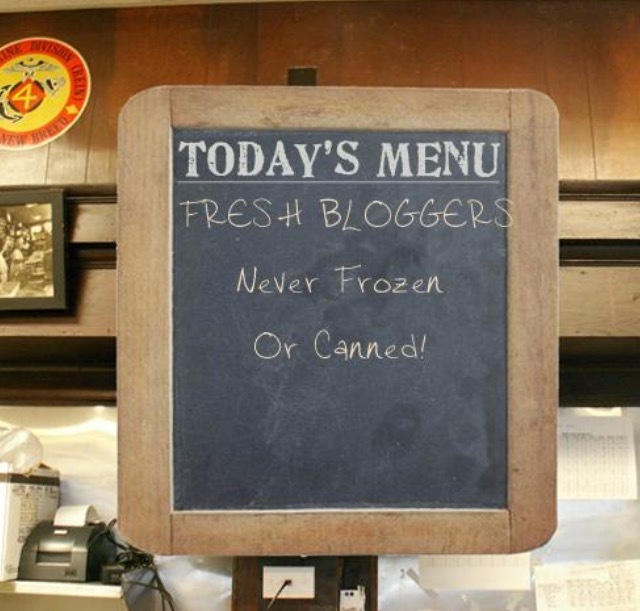 What a creative and funny way to express how hangry us bloggers are lol. Love it. thanks for making my morning. Funny! I especially liked the starving writer’s menu. Sharing on Facebook and I subscribed to your blog. Oh thank you! Wishes DO come true. I don’t know how I missed this kind comment of yours but please forgive my delayed thank you! Pot boast for me since all the litterations have been scattered throughout the previous comments. How about a parents thesis for your next post? Jeez I love what you come up with, Steph. LOL you slay me Steph!! Tweetballs. If you know Twitter, I’m shocked Tweetballs aren’t trending! Personally, I love a conventional cup of the cliched clam chowder, crackers crushed, please. Mmmm . . . Tasty! How about Sizzling Soliloquys and Simmering Silly Blurbs, topped with a huge dollop of Pro Crusty Notions? Ack!! Clearly I meant to leave this comment on your other post, “How I came this close to being Freshly Pressed”! Damn multiple tabs and being too sleepy to navigate between them. Very creative menu. I can tell it is all organically contrived. For those robust eaters are they served on a laptop or for those watching calories perhaps mini tablet. Served with compliments no doubt. Delicious idea. I know what I want for dessert, ; ). Very clever and so funny. I’d like to come in for a full meal and dessert. I’l like a Pina Commalada too! Haha! TOUCHÉ !! Thanks so much for tweeting and following. I have been thinking about opening a restaurant called Sam ‘n’ Ella. What do you think? Too early in the morning here for any witty remarks from me, Stephanie, but I enjoyed soaking up yours. Thank you again, Christine. Always interesting to hear from someone on a completely different time zone! Wasabi Widgets, Ralph?? Coming right up!! Very good.. Published Plum Pudding for me please. Coming right up, Miss! Thanks for reading/commenting and following. I’m thrilled to have you! LOL just the laugh I needed! Hopefully calorie-free too. Not that someone with the word “Fit” in her name cares about that! Thanks for commenting! ahhh, I gotcha! Love the wordplay even more now! What’s good on the Reddit-to-eat menu? Yeah, I love those Reddit custom online signs, which I gather is what you recognized from my opening restaurant menu signboard image? those moments when you relate a little to much to the “starving artist special”!!! It was great! I just had to share! This sounds like some tasty blogging. I’m pretty sure my favorite would be some bitter rhubarb pie. So are you in Seattle? Hey you – – my plans fell through for this summer and actually since I’ve been monitoring your weather, I’m kinda glad. What was up with the 90 some degrees for weeks on end?? NOT for me. Blech. Anyhow, then the New Yorker “Big One” article came out and I’m rethinking plans to move there. Your take on that? Wait, what? You’re thinking about movie to New York? WHAT? How cool! I wouldn’t ever want to live there, but huge opportunities, amazing! As far as the weather, that seriously never happens here. I remember maybe a few years ago, the weather was like 65 on July 4th. It’s been weird here the last few years. It should probably be fine next year. Anyways, good luck in NY if you go there! about The Pacific Northwest and scared me so I am rethinking my plan of moving to Seattle! Holy crap! Thanks for showing this to me. Now I’m completely, totally, and 100% ready to move somewhere safe. Aha! I just knew clever writers (like yourself!) would come up with some great ones! How about some mumbo jumbo rad gumbo served with prefix parmesan?? Perhaps with a thought torte…as long as it’s not store bought!! Love that Marissa . . . I can feel my mouth (or possibly my mind!) watering at the very thought. Thanks for tweeting this too, Ned. And how the heck did I miss Prime Rib on my own blog? Thank goodness you visited today. Always an honor, Sir.